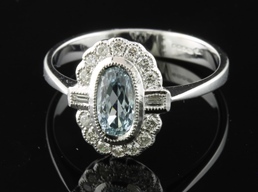 Handcrafted in the 1920's vintage style this beautifully detailed ring is sure to please. Bead set in 18kt white gold with a lovely oval aquamarine surrounded in sparkling diamonds. The free flowing lines if this piece are graceful and organic. The hand finished patina glows and the diamonds twinkle. This band is meant to be worn and admired! 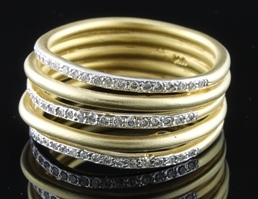 Beautifully hand crafted in 14kt yellow gold with a touch of sparkling diamonds. The hand hammered patina of this ring is truly lovely. 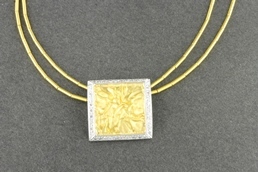 Notice the organic lines, very pleasing to the eye and the diamonds add just the right touch of sophistication. 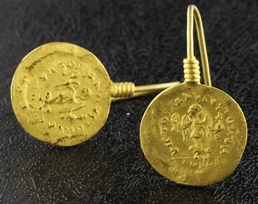 The gold of these earrings is hand hammered and has a softly glowing brushed finish. A small diamond set at the top of each earring adds a lovely twinkle. Reminiscent of the fresh green spring leaves, the emerald in this ring is a perfect center piece. 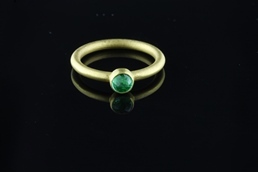 The warmth of the 24kt gold pairs nicely with the glowing green of the emerald. Unique and alluring, this piece is a real eye catcher! Handmade in Turkey from 24kt gold and set with glimmering diamonds .36ct. 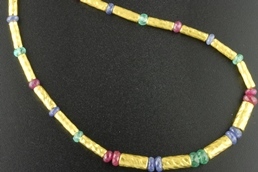 This 24kt hand crafted necklace with genuine ruby beads is classy and timeless. Versatile enough to pair with evening wear or casual wear. 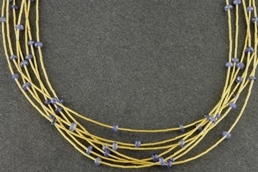 The deep blue tones of the sapphire beads in this piece set off the glow of 24kt yellow gold. 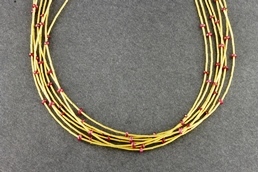 The delicate strands of this necklace drape beautifully and compliment any skin tone. 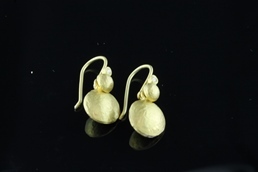 There's nothing like pure gold formed into beautiful pieces that you can wear. These earrings are a true testament! Made in Turkey from rich 24K gold and backed with hand rolled wires made of 18K yellow gold. Add a little sparkle in your life! 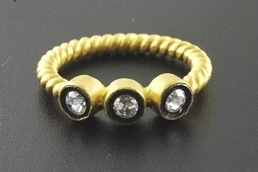 Set in 24K yellow gold and bezel set, the three rose cut diamonds on this ring have a halo of black enamel surrounding them to accentuate their unique brilliance. Hand crafted in Turkey. 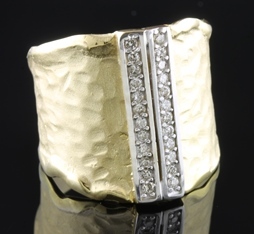 Rich 18K and 24K yellow gold is hand cast and finished in true Turkish contemporary style. Intermittent rubies, sapphires, and emeralds add just enough accent of color to make this a standard for any day wear. 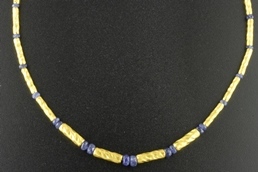 Handcrafted Turkish 18K and 24K yellow gold is accented with faceted sapphire beads. Rich and elegant, this piece will be your new favorite. Ask about earring and ring options to complete your set!